Hearing aid technology has taken a quantum leap forward in recent years. There are now hearing aids that can fit any ear shape and improve nearly every problem. Tune into the world around you with the sleek, hidden designs and advanced features of modern hearing aids. Like tiny, high performing computers, their modern technology and ability to connect wirelessly to other devices, such as cells phones or TVs, is revolutionary. What do modern hearing aids have to offer? The latest hearing aids offer rechargeable batteries. When charged, the batteries allow the user to enjoy up to 24 hours of uninterrupted hearing. You can charge your hearing aid as easily as your mobile phone. With no batteries to dispose of, rechargeable hearing aids are also environmentally friendly. The most advanced hearing aid technology. Can be paired wirelessly via Bluetooth with smartphones or smart watches. You can make a phone call easily via the hearing aid using Andriod, iOS or other operating systems. You can also connect wirelessly to your TV; this turns the hearing aid into wireless headphones, allowing you to enjoy the sound at your comfortable level. With so many options, how do you choose? Hearing aids come in a variety of different styles and colors; each different variety comes with its own advantages. At Crystal Vision & Better Hearing, our hearing professionals are extensively trained in picking the right product for your needs. Some things to remember for proper hearing aid handling and storage are as follows: avoid heat, cold, chemicals, and, above all, moisture. Do not store your hearing aid near heat sources such as stoves, fireplaces or even in direct sunlight. Saunas, pools, showers, rain and even perspiration can potentially damage a device. If it does get wet, open it, and allow it to dry thoroughly. Hearing aid repair and service can be completed at your Crystal Vision & Better Hearing in-store. Our technicians are trained to clean and service your hearing aids, working with manufactures to help with any warranty claims. We service or repair almost all makes and models of hearing aids, and we even clean them for free. Remember, most issues are preventative. By following a simple cleaning and storage routine you will extend the life of your hearing aid and even give it a higher quality of sound. Call or come in to your local store for details and more information on the care and maintenance of your hearing instruments. 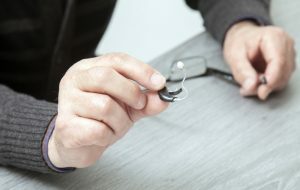 There are dozens of brands of hearing aids that offer an impressive range of products and an equally impressive range of cost – anywhere from a few hundred to thousands of dollars. The more expensive hearing aids will normally perform better, have more features, and will be more efficient at eliminating background noise. But don’t worry, with today’s technology, even the less expensive hearing aids will make an incredible difference and improve your quality of life. Crystal Vision & Better Hearing is here to make sure you are aware of the range of different hearing aids and their associated costs. We will do whatever is in our power to find you the hearing aid that will meet your standards and your budget. At Crystal Vision & Better Hearing we offer hearing aid financing and monthly payment plans. For more information on our hearing aids or to schedule an appointment, please don’t hesitate to contact us today at (604) 795-5367 (Chilliwack), (604) 466-3937 (Maple Ridge) or (604) 541-3937 (White Rock)!